Welcome to the newsletter for the Find TB Resources Website. The purpose of this monthly newsletter is to inform you about the featured Highlight of the Month, additional helpful resources in the database, and other updates to the website. 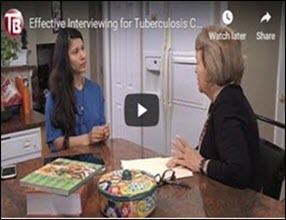 This month's highlight features Effective Interviewing for Tuberculosis Contact Investigation: Video and Checklist, from the Global Tuberculosis Institute at Rutgers. The video presents an overview of interviewing for TB contact investigation, excerpts of a TB interview and a re-interview, and commentary from experts in the field. The checklist focuses on critical elements of a TB interview. 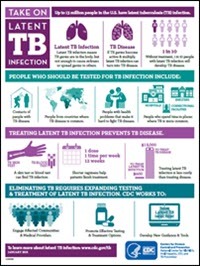 Take on Latent TB Infection, from the CDC Division of TB Elimination. 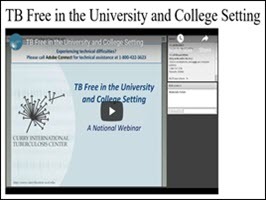 TB Free in the University and College Setting, from the Curry International TB Center. 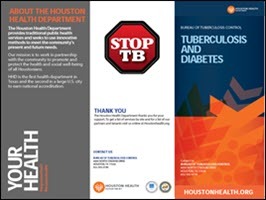 TB and Diabetes, from the Houston Health Department Bureau of TB Control. To order or view these materials, click on the images above. Your one-stop site to find & share TB resources.